I solo-played a divisional level Over the Hills game in my first attempt at a serious playtest of these rules. 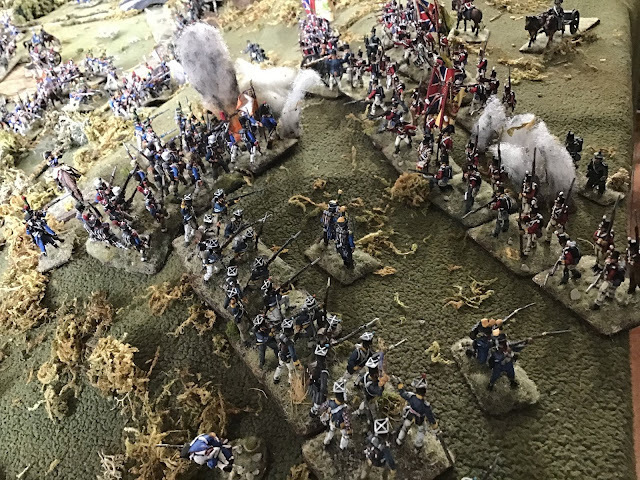 I was excited to try these out as up to now I had mostly played games where the brigade was the key game element and I was looking for something a bit less abstracted for smaller engagements that would give the feel of an actual Napoleonic battle. I had read that OTH fit this bill. 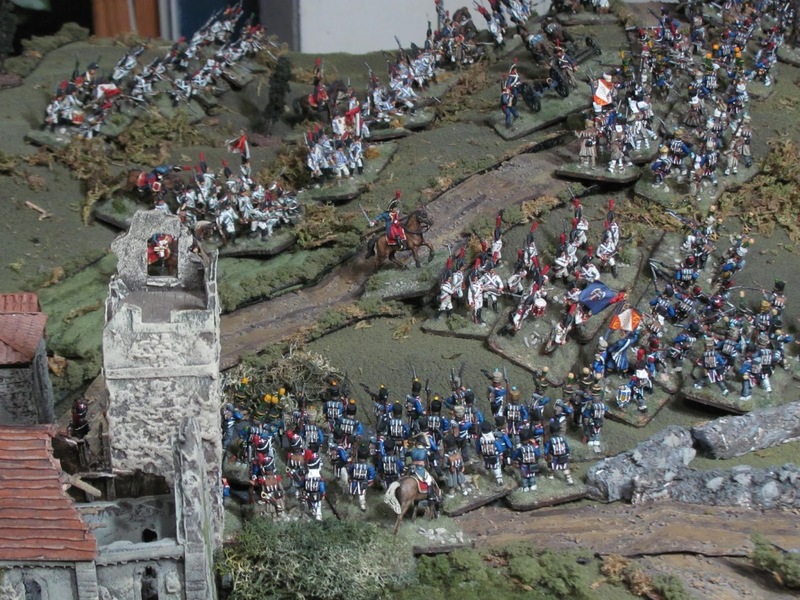 It was a fictional scenario, set in the Peninsular War, with the British on defence on the high ground and the French attacking. 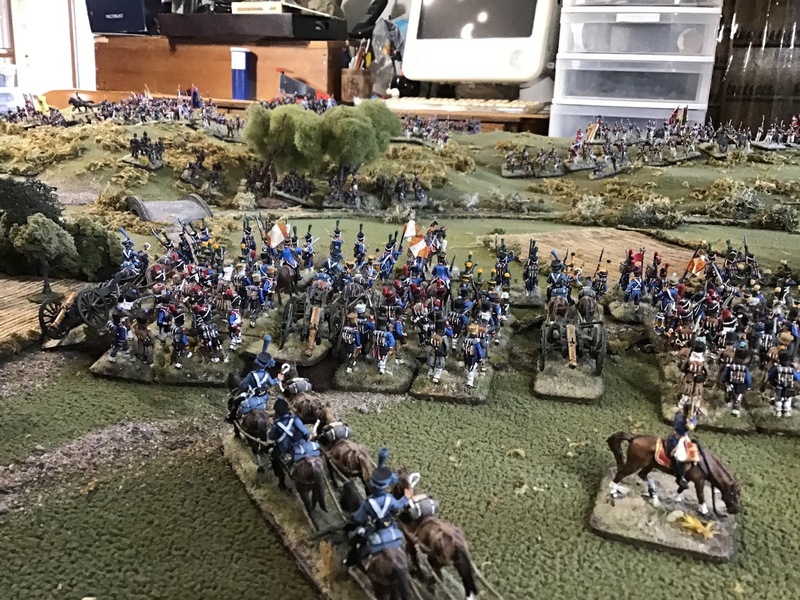 The forces were roughly equal, the French having a battalion of infantry advantage, one more battery and two regiments of horse to the British one. 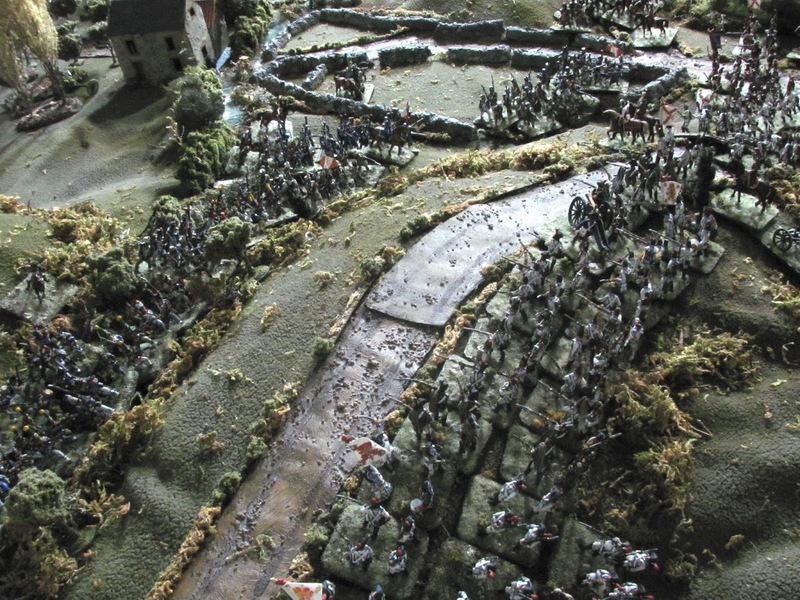 The British strung out in supported lines across the high ground, sending a battalion of Rifles to hold a forward position in the centre, in skirmish formation in a woods bordering the stream that traversed the battlefield. 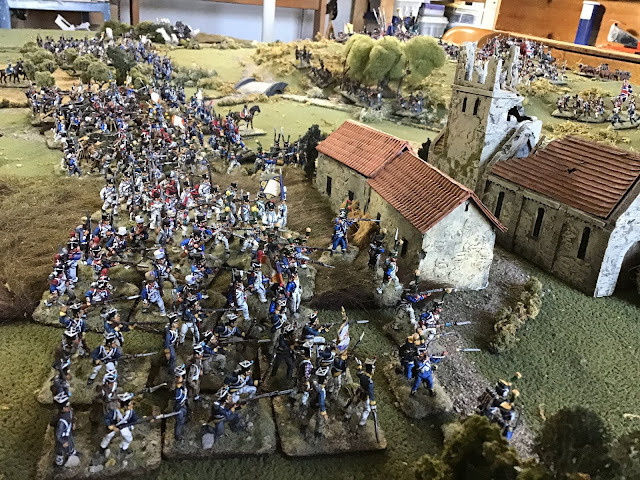 The French elected to send the bulk of their force against the British left (employing two brigades, one very strong) while the third brigade and cavalry tied down the British right. 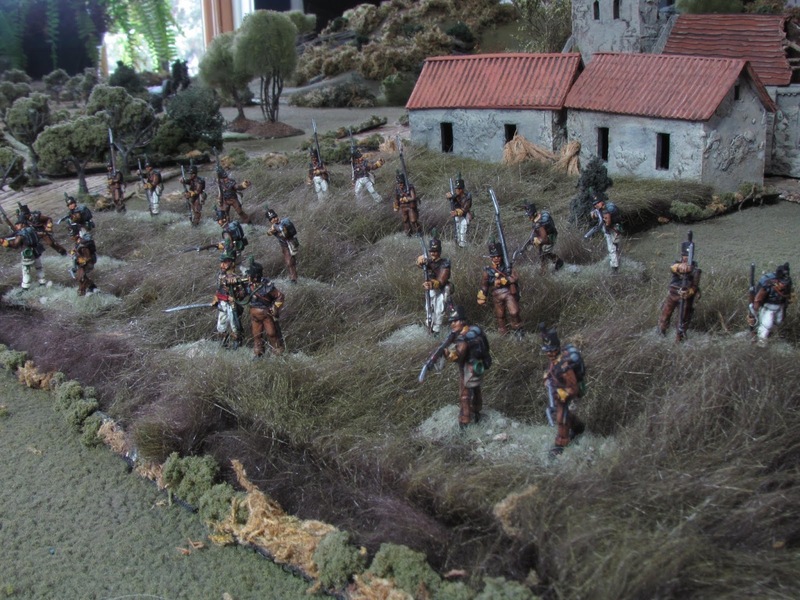 Rifles in skirmish formation deploy in the woods in the British centre, with the remainder of the brigade behind in reserve. 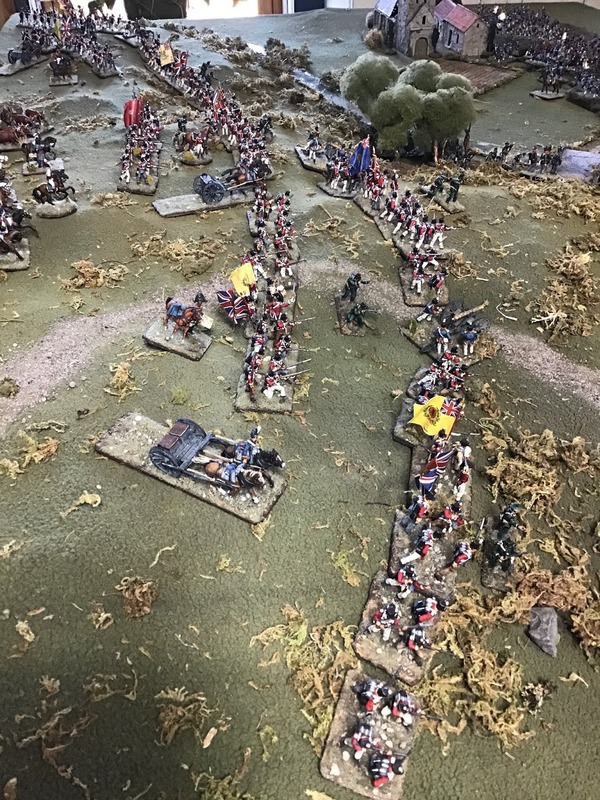 The British left, two battalions up, one back. 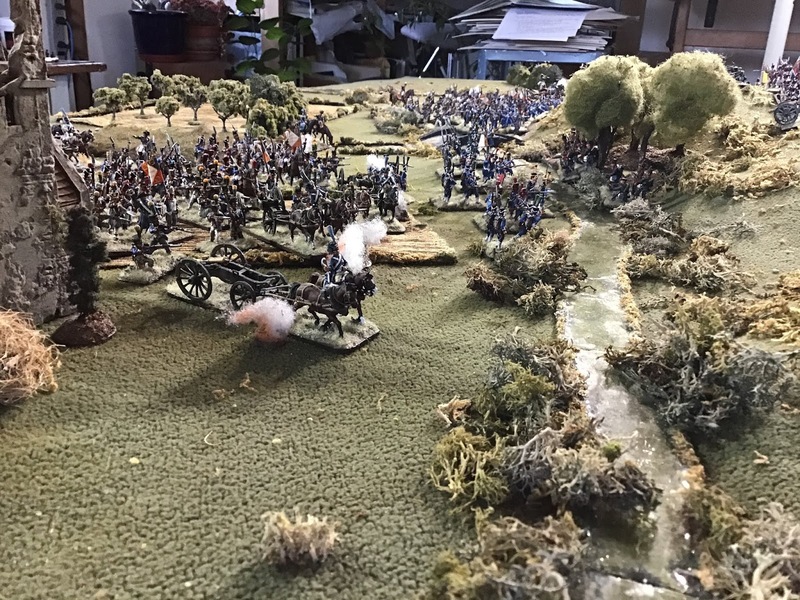 The French advanced in column, ranged behind two battalions of light in skirmish formation, screening them from the enemy cannon. French right skirts around the village. 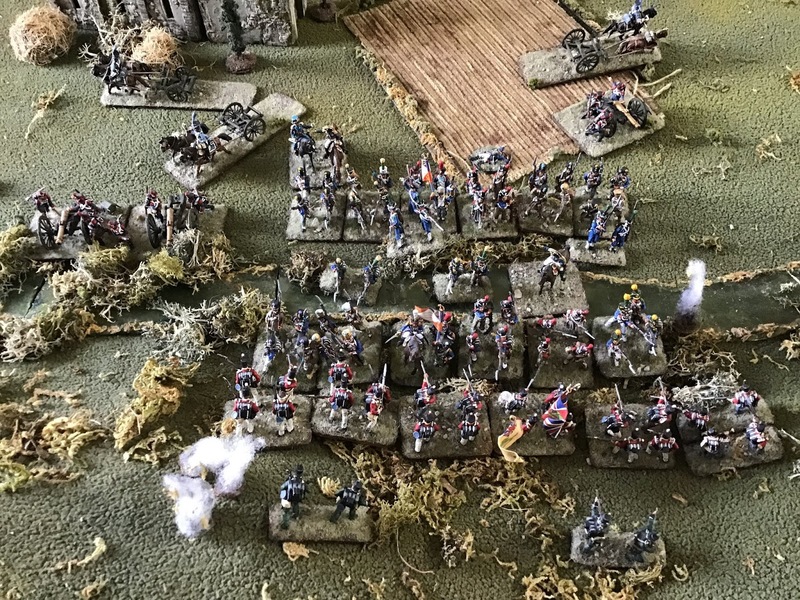 French centre advances in column. 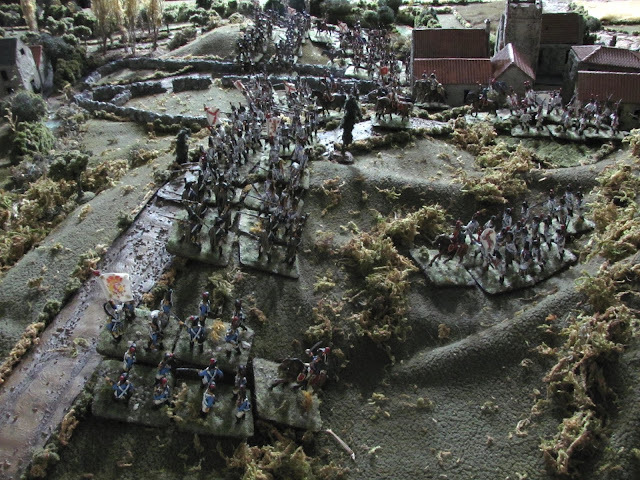 As they approached the stream, the skirmishers converged on the Rifles along the stream, attempting to drive them from their forward position. 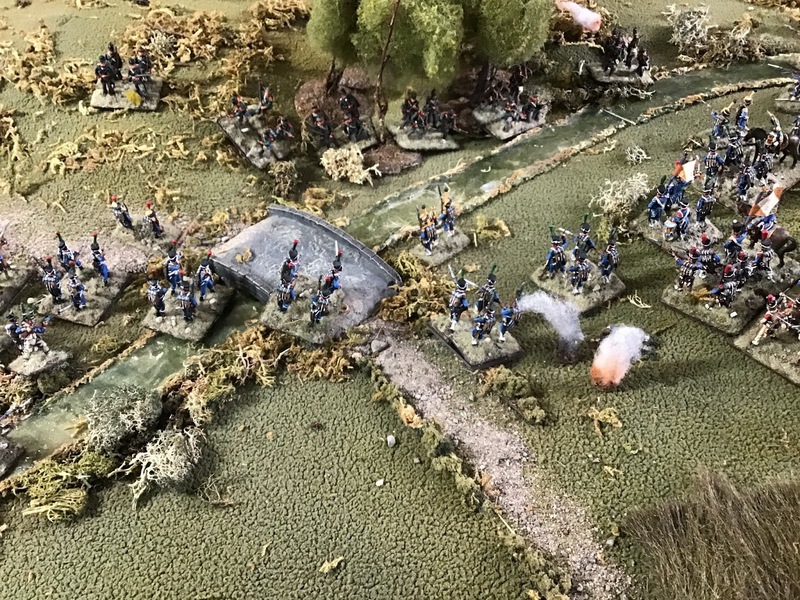 This was the first surprise for me wearing my French general’s hat, discovering that open order skirmishers along a steam and in cover of woods are not so easily dislodged! 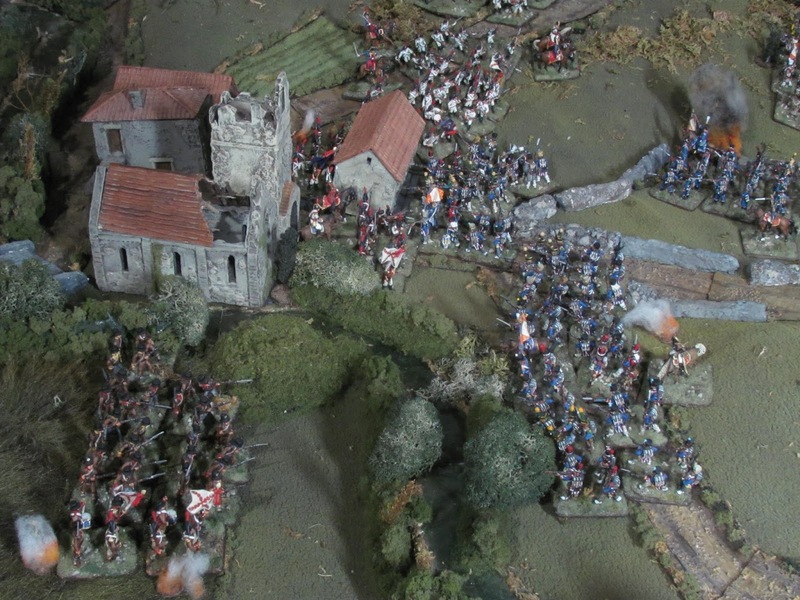 Two French battalions of light infantry fail to dislodge the Rifles in a tough skirmish battle. As the French light infantry hit this speed bump the bulk of the French cannon unlimbered on the right, keeping the British guns engaged as the French columns advanced towards the high ground. 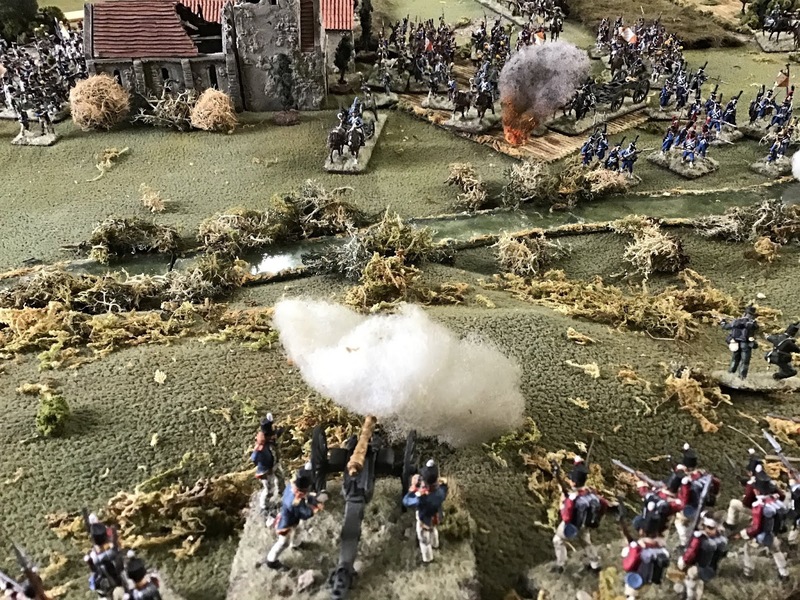 French guns deploying to the front take fire from the British cannon. 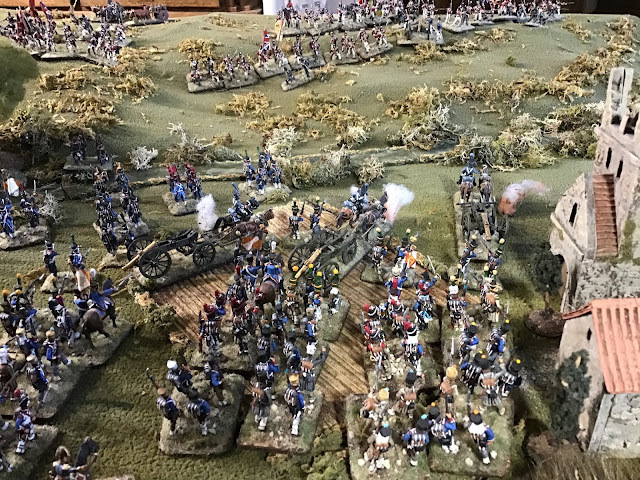 British cannon engage enemy batteries as they advance. French centre skirt around the right flank of Rifles to press home the attack. 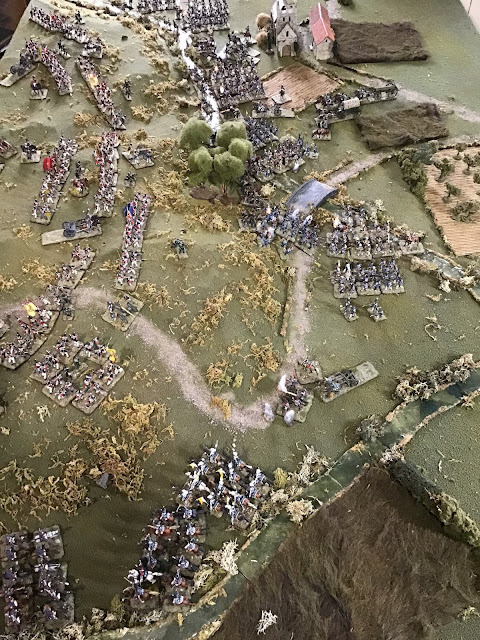 Overview of battle. 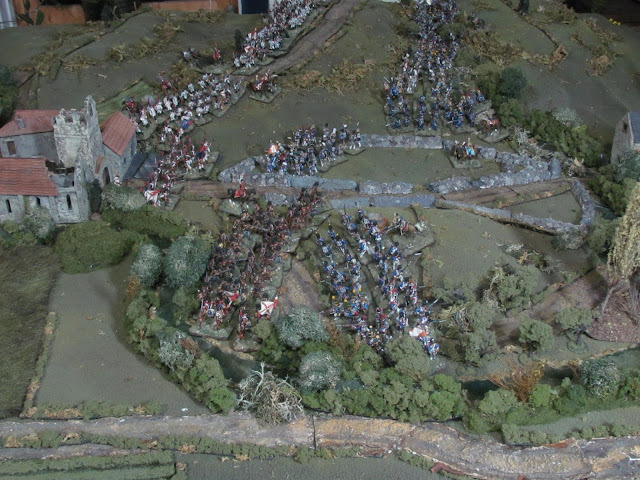 Lower left Hussars come face to face with the French cavalry as they form up on the near side of the stream. 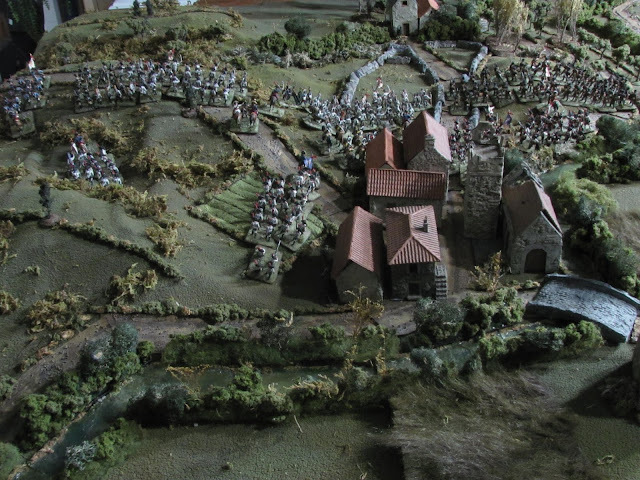 In the centre the left flank of the French attack holds back while the light infantry try to dislodge the Rifles from their woods while at the top the attack on the British left and centre left prepares to go in. The French centre became a bit tangled up with the skirmish battle going on here, but their right brigade (with a battalion each of Poles and Wesphalians) made good headway and closed with the British far left. 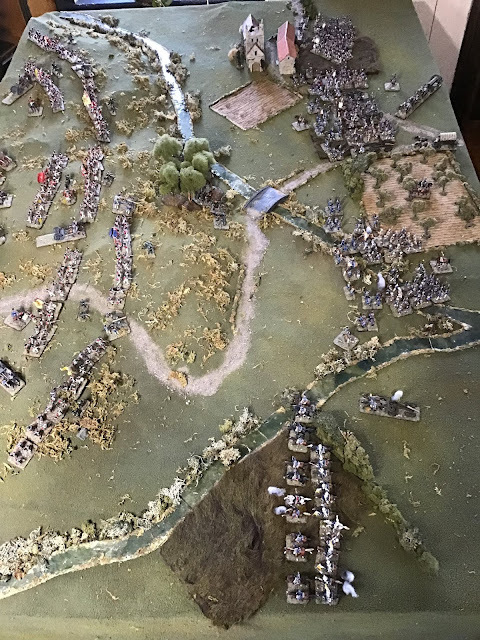 Initial success sent the British brigade here reeling back, but they managed to rally, with the battery on this flank sending a devastating load of canister at short range into one of the victorious French columns, causing it to rout. Poles (foreground) and a second French brigade slam into the British left, driving it back. 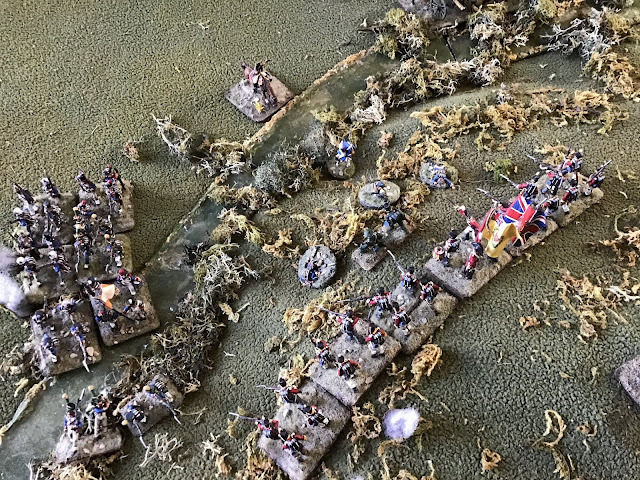 Short range canister fire routs one of the brigades and the British right holds. 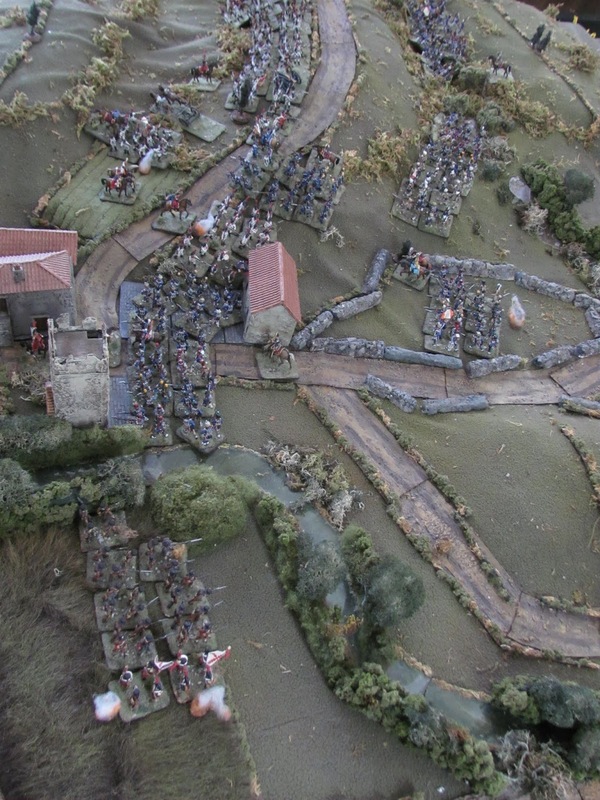 Wellington surveys the battle as it unfolds. French cavalry advance to the stream in line. 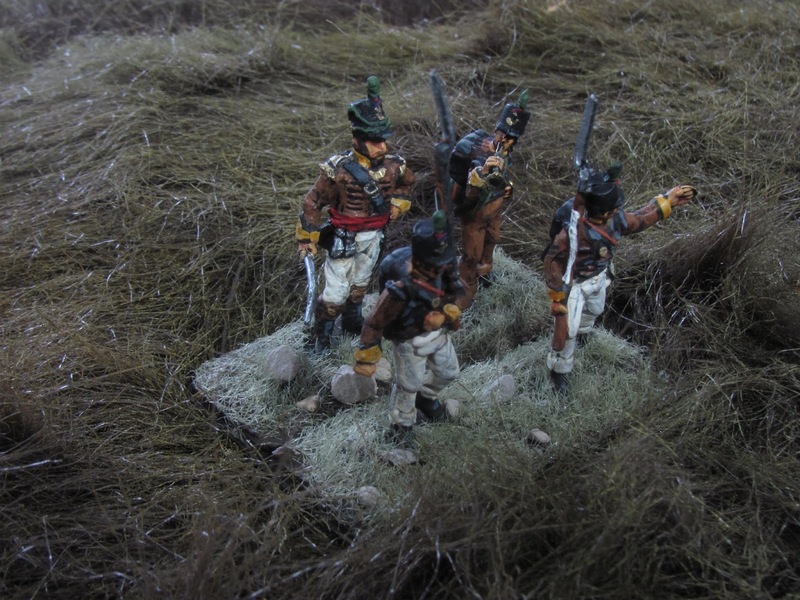 On the British right things began badly for the defenders. 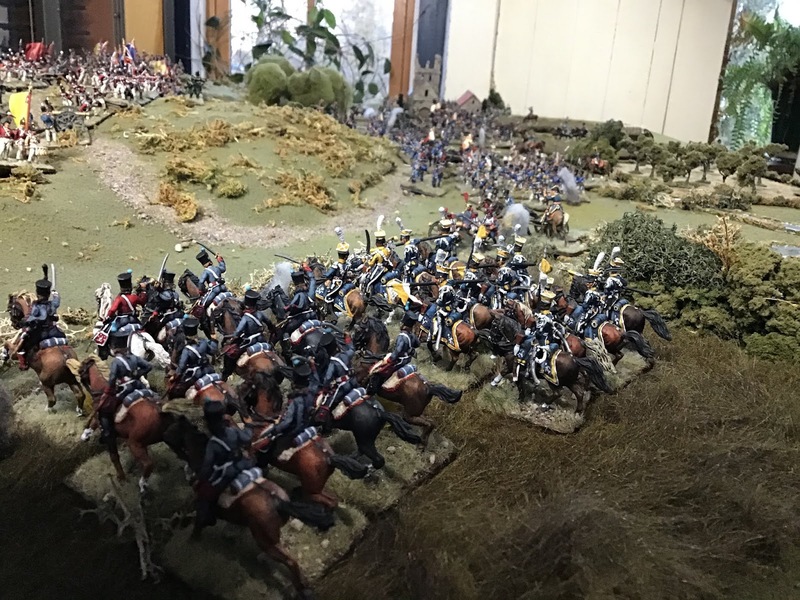 The two cavalry forces played cat and mouse as the French horse crossed the stream, having formed up in columns of squadrons first. Forming into columns of squadrons before crossing. Two battalions of British infantry, seeing the horse, wisely went into square, while the British cavalry held back between them looking for an opportunity to engage the French horse on favourable terms. KGL Hussars take refuge behind infantry squares. Vistula Lancers ride a British battery into the ground and scatter a battalion of infantry on the British right. The charge, however, drove the lancers deep into the enemy line, and, receiving more hits from flanking fire from the squares they were forced to retire and the flank held. Meanwhile, on the French right, the foreign brigade was in trouble, as the stubborn British battalion on this flank refused to give up anymore ground. The Rifles, too, held fast against repeated attempts to flush them from their central position in the woods. 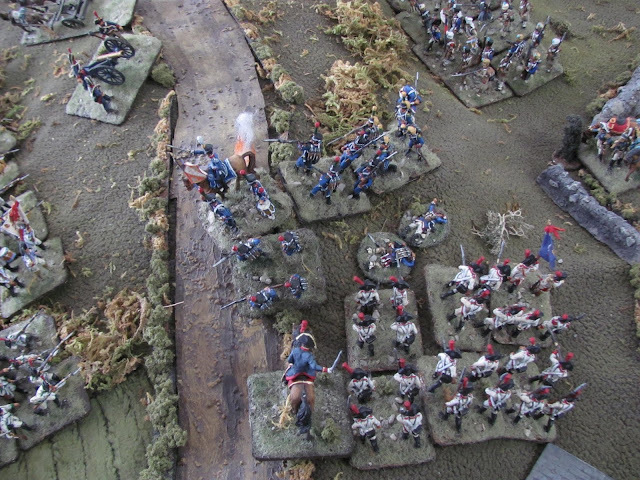 The French finally pulled back their skirmishers and brought up cannon to try and drive them out. And a French battery is brought up to try and drive the skirmishers out. The French commander, wanting to support his struggling troops on his far right decided that, rather than have these irksome Rifles hold up the attack any longer, he would throw his strong brigade across the stream to hit the British line on the enemy’s centre and bypass them completely. 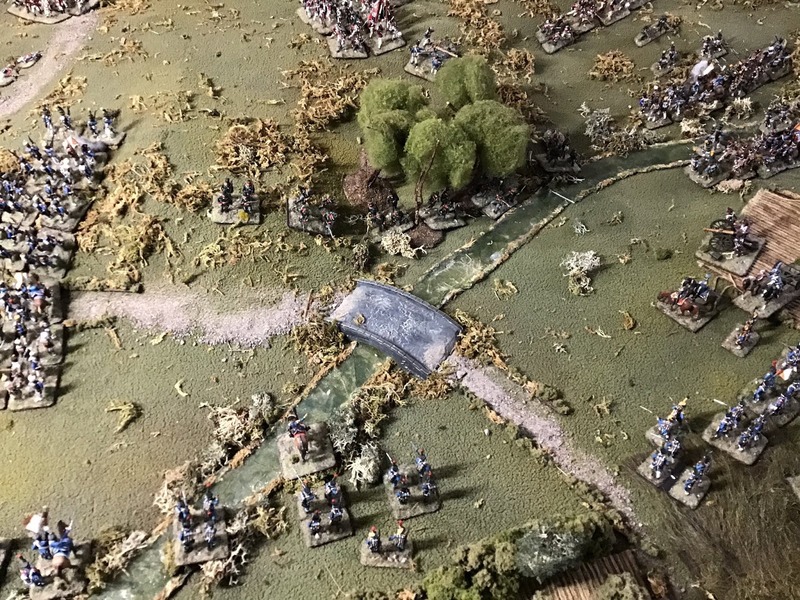 The enemy battalion facing this threat, let loose a devastating volley and then charged the enemy, throwing him back down the hill and into the following line, destroying it as the two battalions became interpenetrated with one another. Huzzah! British fire and charge French centre. As if things weren’t going badly enough for the poor French, a brigade was also marching into disaster on their far left. 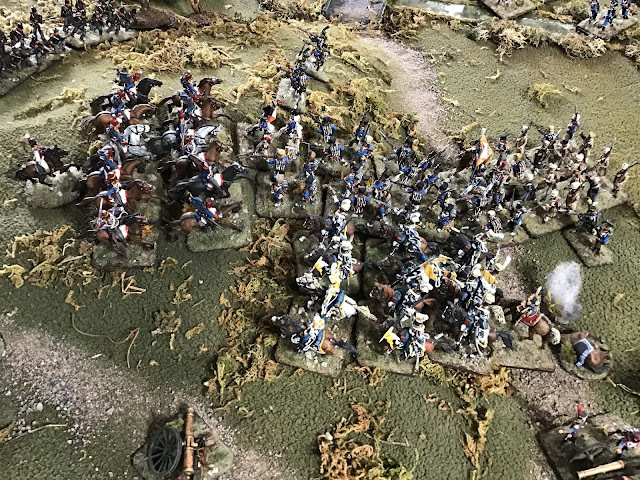 With the British cannon destroyed on this flank and now the entire British brigade in square, the French columns, thinking themselves now safe and supported by cavalry, skirted around the Rifles in the centre to bring pressure on the British right. 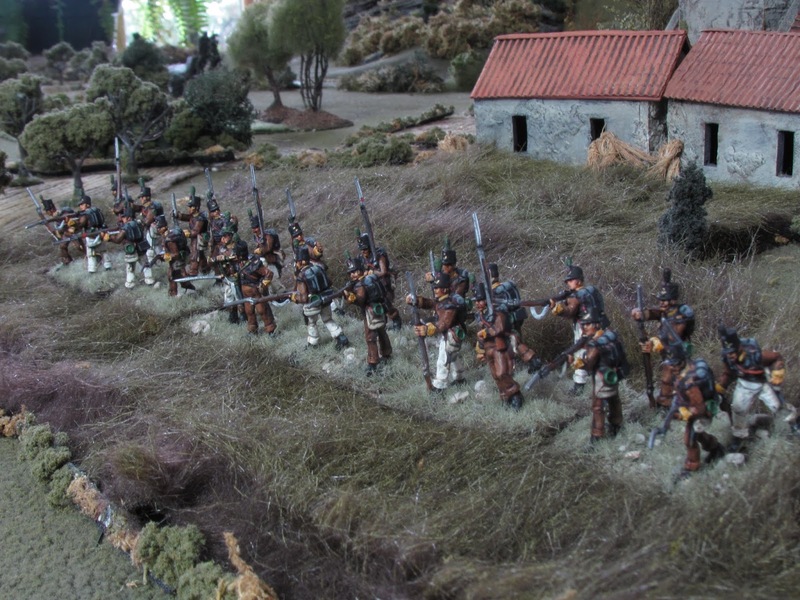 French march on British squares. Hussars charge into the french columns. 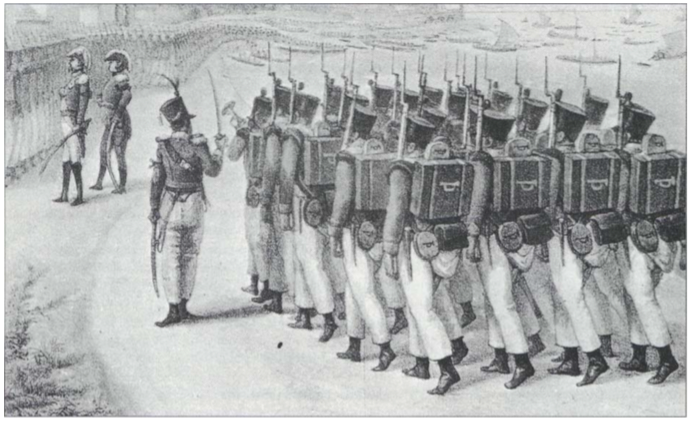 But lurking between the squares was the British cavalry, which charged the lead French battalion. It failed to form emergency square and was destroyed, the spent lancers next to them were caught flat-footed and routed, and then the second French battalion also ridden down before able to form square. 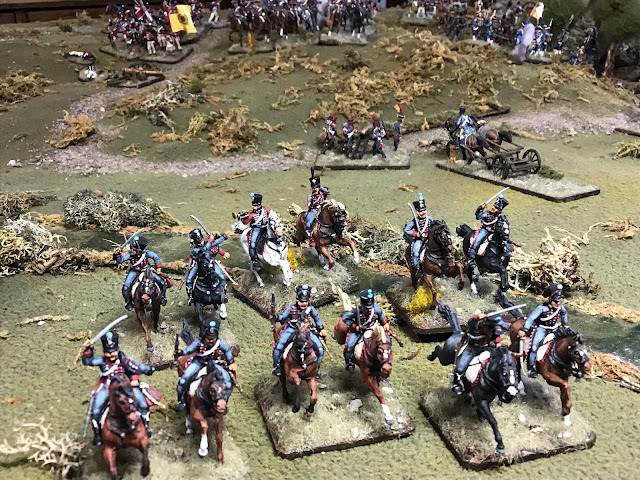 In an instant the French attack on the left was annihilated, and devolved into fruitless charges and countercharges between the remaining French hussars and their British counterparts. 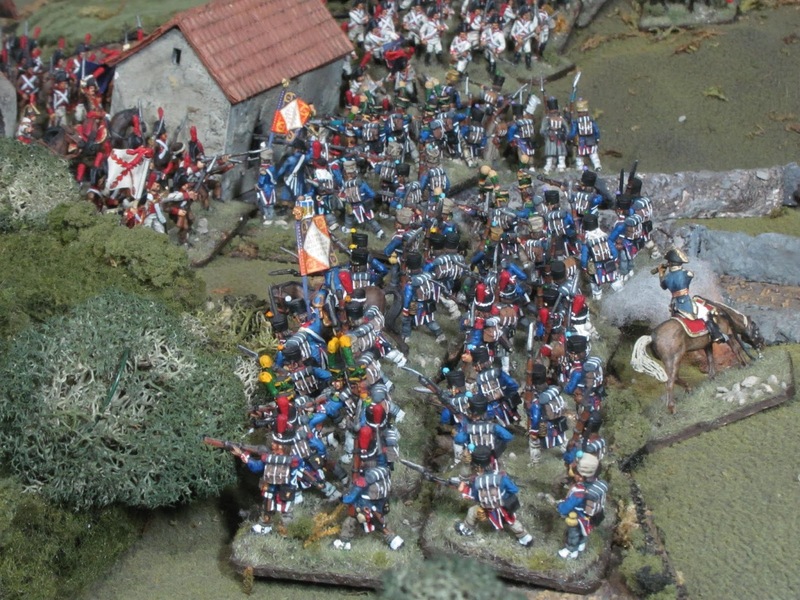 Lancers rout from the field, despite the best attempts from their officer to stop them. 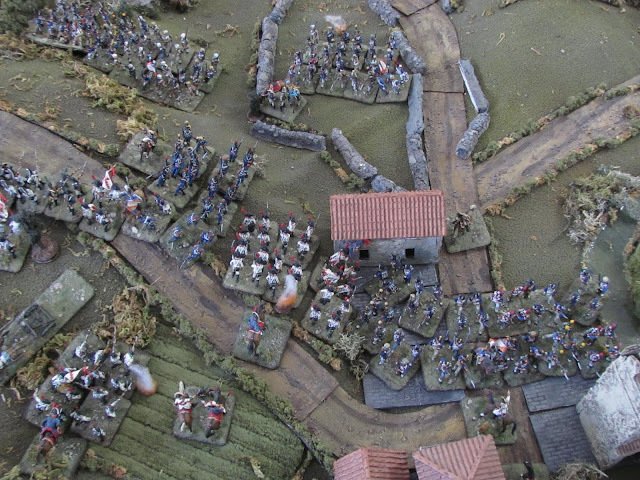 With the French left decimated, the British commander could begin to move his centre and right over to help his left. The Rifles were pulled back from the stream, continuing to skirmish with the French light while in a series of subsequent attacks, the French were driven off the British high ground. Huzzah again! 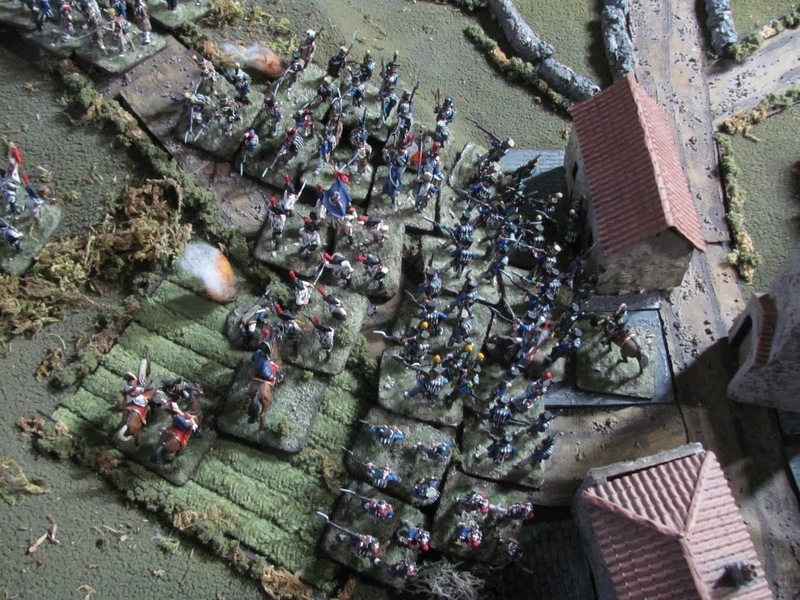 A second French battalon is scattered. Wesphalians make one last attempt at cracking the British right. 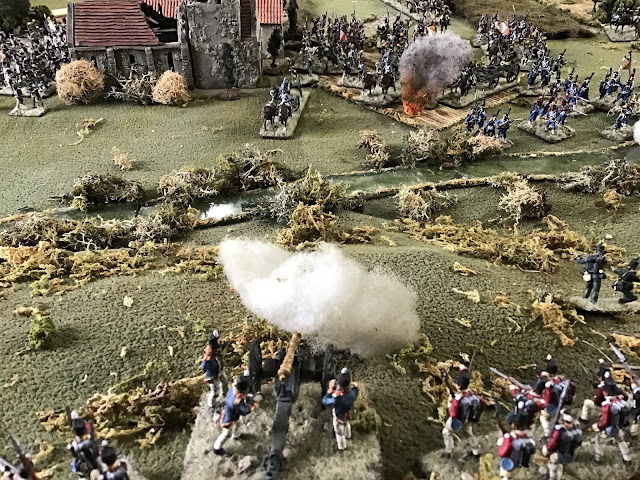 The only final success on the part of the French was the destruction of a second British battery by artillery fire, but as two or three more French battalions were routed or destroyed, there were no troops left to exploit the French advantage in guns. 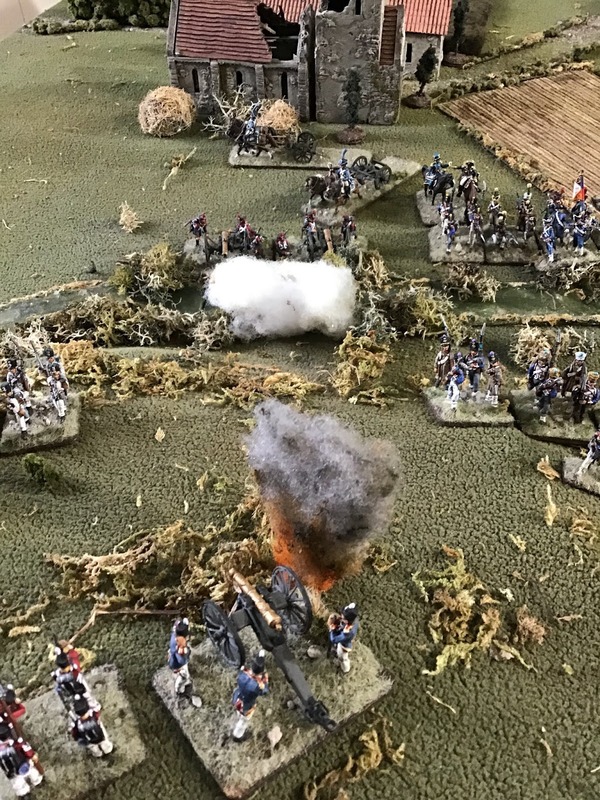 British battery silenced by French fire. 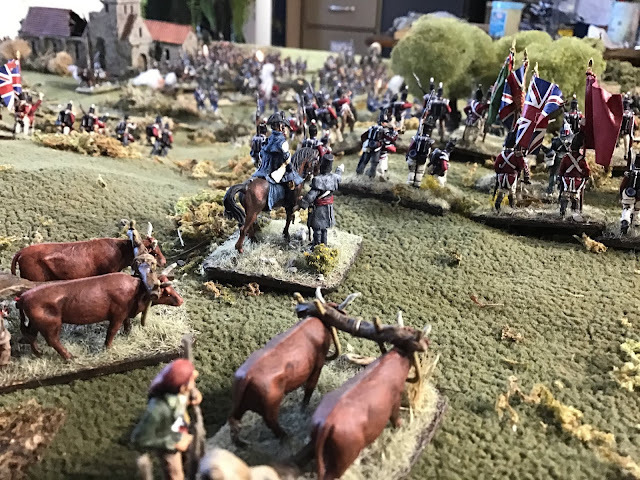 The final butcher’s bill was one battalion and two batteries lost for the British to six battalions of infantry and a brigade of horse lost to the French. 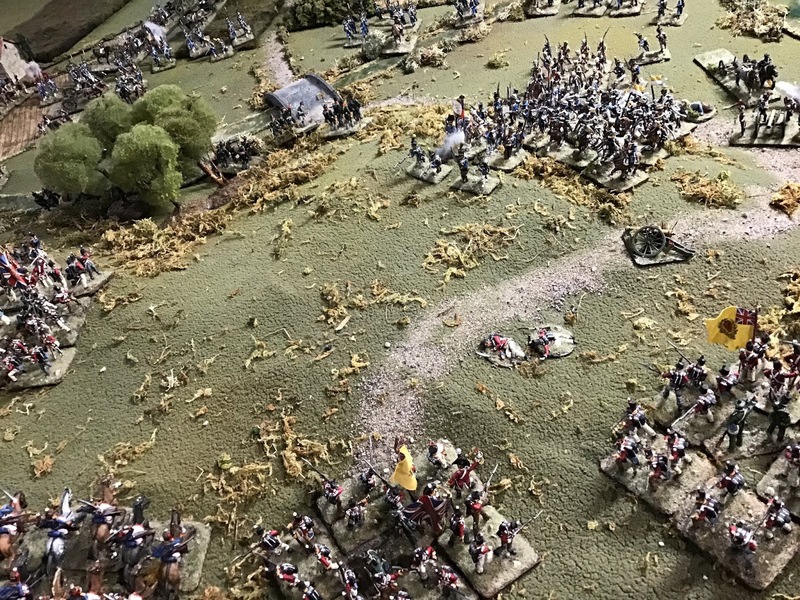 So a resounding victory for the British. 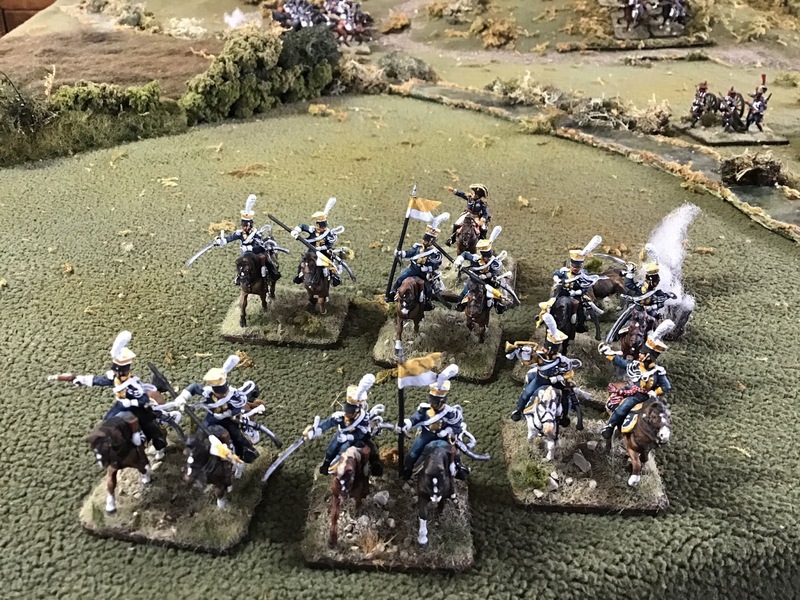 French hussars also routed form the field. The game was a lot of fun and I loved this rule set. I’m thinking that there are two or three optional rules I may let go as either too fussy or just too hard for me to remember (for now at least!) but overall I loved the look and feel of this game. I wasn’t using Orders either, which would make a huge difference, but I wanted the freedom to simply try things out. Employing entire battalions as skirmish screens looked and felt right on the table and made skirmishers seem a bit less abstracted than they are in the core rules. I loved the interaction between horse and infantry squares, the vulnerability of infantry not in square, and how in this game the British right simply formed into a series of squares with interlocking fields of fire as the only reasonable response to enemy horse. The British ability to volley and charge against the French (mostly attacking in columns) was devastating for the French and felt right. So eager to have another go! 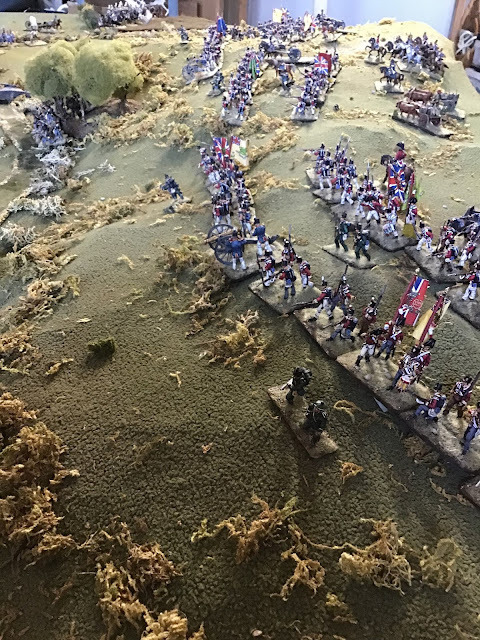 We did a refight of the battle of Espinosa de los Monteros based on a scenario I wrote a couple of years ago (an earlier AAR can be found here). Spoiler alert, but the Spanish lost again, this time badly through no fault of my poor opponent who was unable to conjure anything over five on a 10-sided die while I regularly rolled tens. 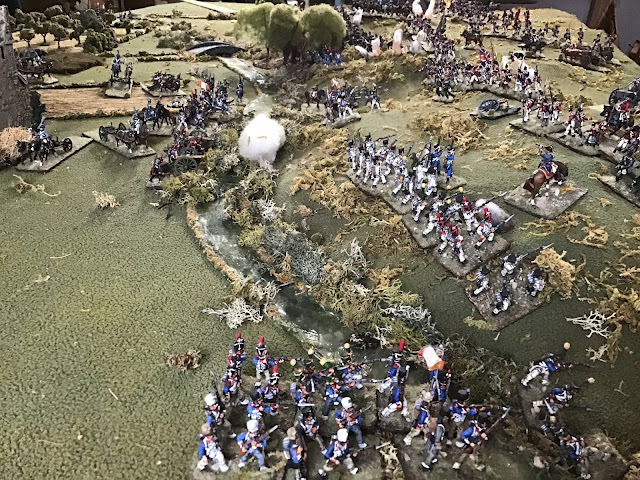 The Spanish, of course, did historically lose this battle but when you look at the ground it was a strong position and I still think, all things being equal, that the Spanish should be able to make a good go of it. 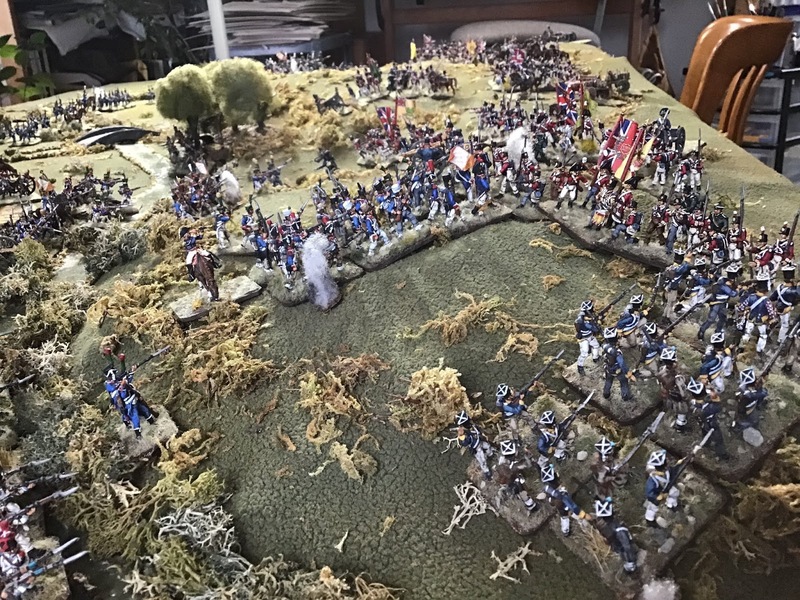 The battle was fought using Age of Eagles II rules and with 1/72 scale miniatures, almost entirely HaT with a smattering of Emhar, all from my own collection. 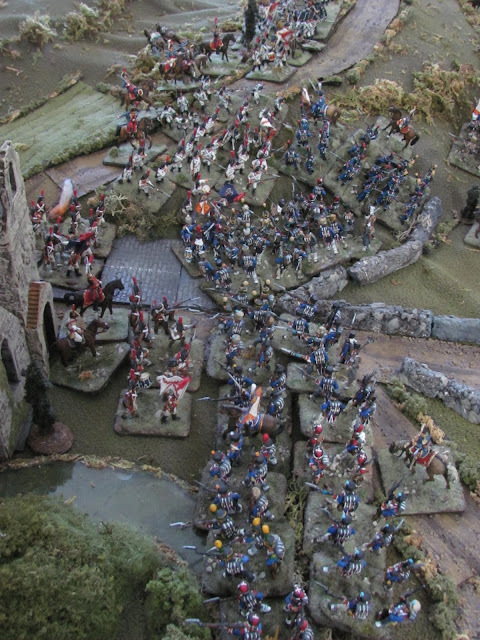 The scenario can be found at this link. 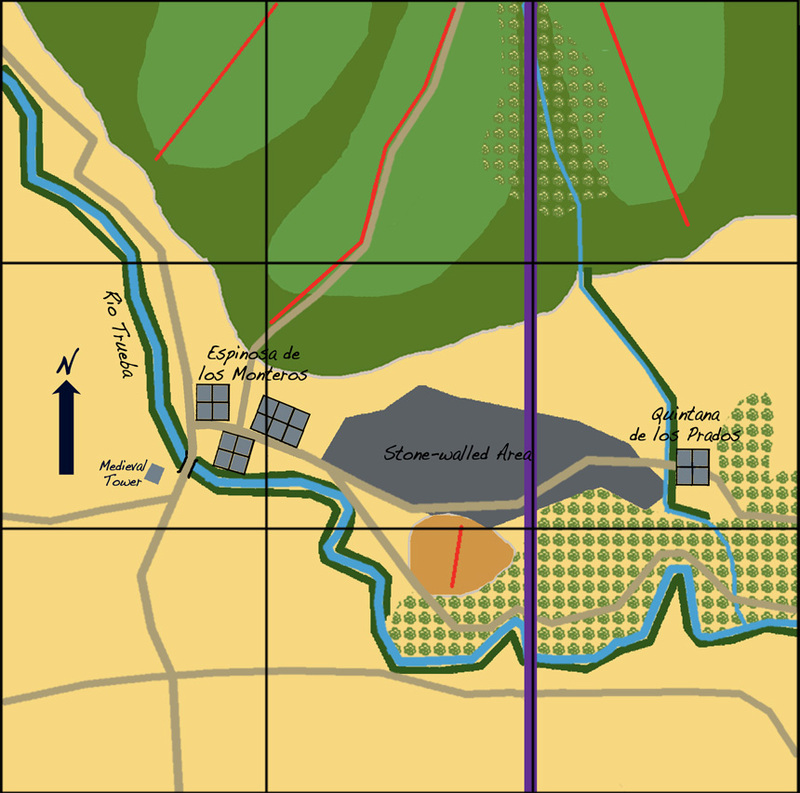 The scenario map. 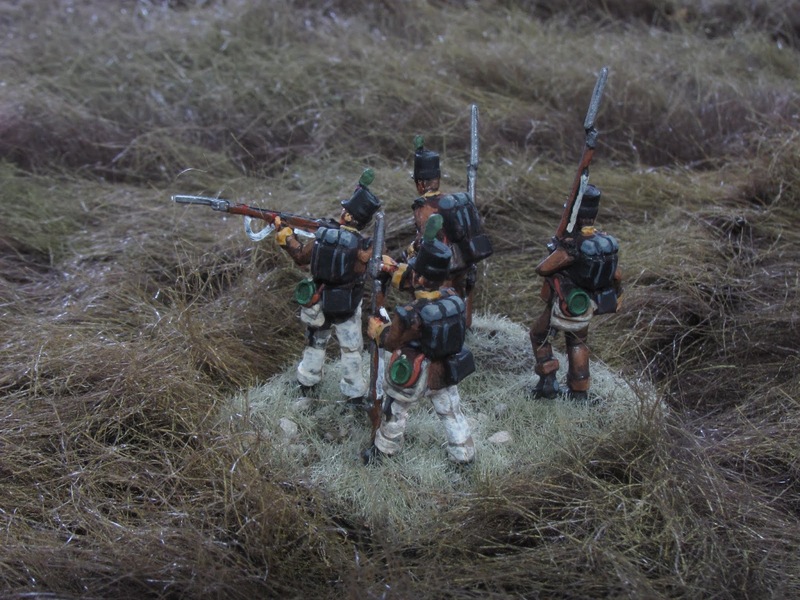 The Spanish under Blake hold a line east of Espinosa, from the small hill in the south to the ridge line of the centre of the high ground. 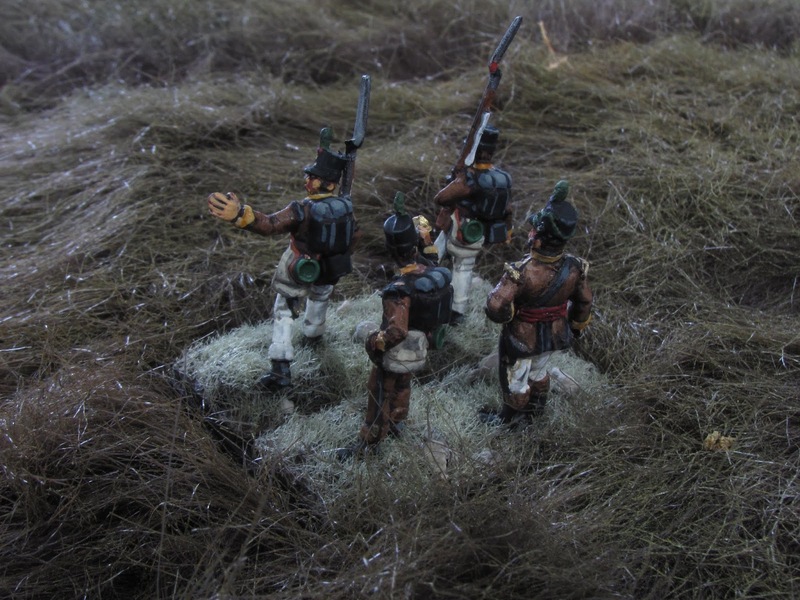 Perrin's French enter east of Quintana de los Prados. Blake arrays his forces in front of Espinosa de los Monteros, placing his best troops in the centre and high ground (right of picture) while his irregular Andalusians under Acevedo hold a small hill bordered by the river on the Spanish right (left of picture). Figuero’s Hiberians anchor the high ground on the Spanish left, with Romano’s division to their right and strong reserves behind. In the centre is Riquelme’s 3rd Division, holding an area of difficult terrain crisscrossed with stone walls while Martinengo supports both him and the Asturian militia on the right. 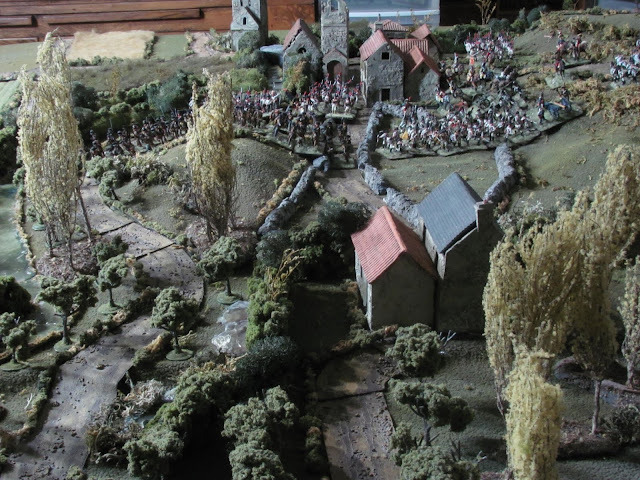 The French attack was based on a demonstration with Lapisse’s division to tie up the Spanish Marshal Blake’s forces on the high ground on the French right while Vilatte and Ruffin attacked french left and centre (foreground). The Spanish moved forward to try and deny the French the advantage of the stone-walled terrain in the centre, but by the time this photo was taken had been driven back by Vilatte so that the French now control that area. 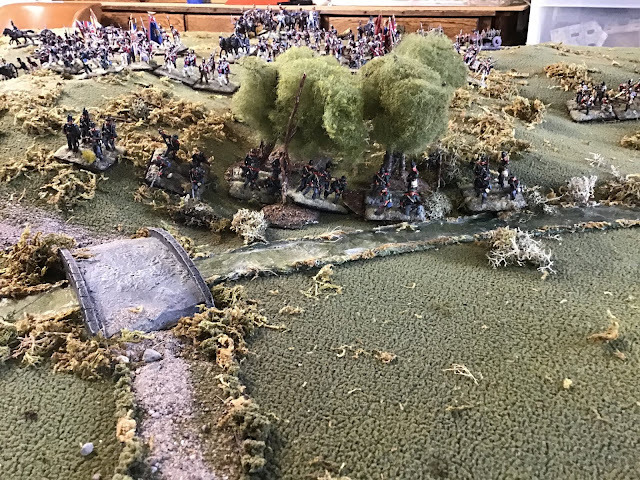 Ruffin (foreground) has advanced through the woods and is arrayed in front of the Asturians preparing to drive them from a low hill on this flank while Martinenego’s 2nd Division has been driven back into Espinosa by Vilatte, badly battered. 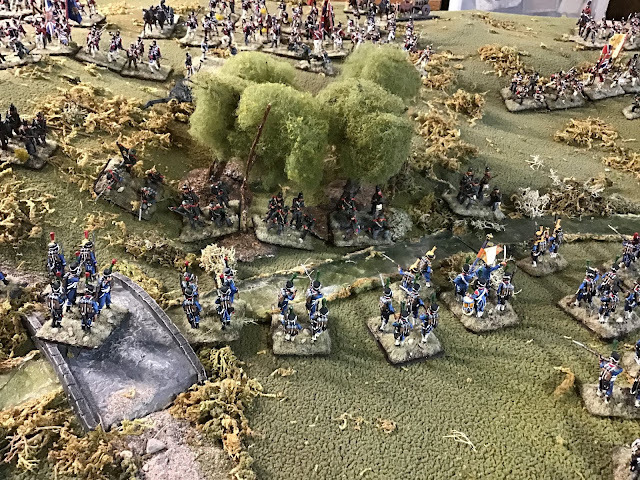 Meanwhile, after advancing rapidly, Perrin is happy to have Lapisse hold a position in the wooded valley below the Spanish left, pinning as many of the enemy as possible here on the high ground. Blake feeds some of his reserve into this line to strenghten it. 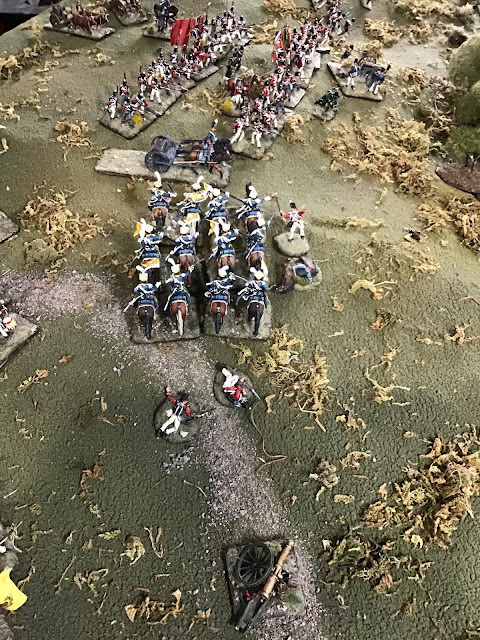 After a brief setback in which the small Spanish cavalry brigade attacks before being driven off, routed, Ruffin decisively pushes the Spanish back. The Asturian militia is driven back over the Rio Trubera and slowly melt off into the hills, surrendering to French control the Spanish right. 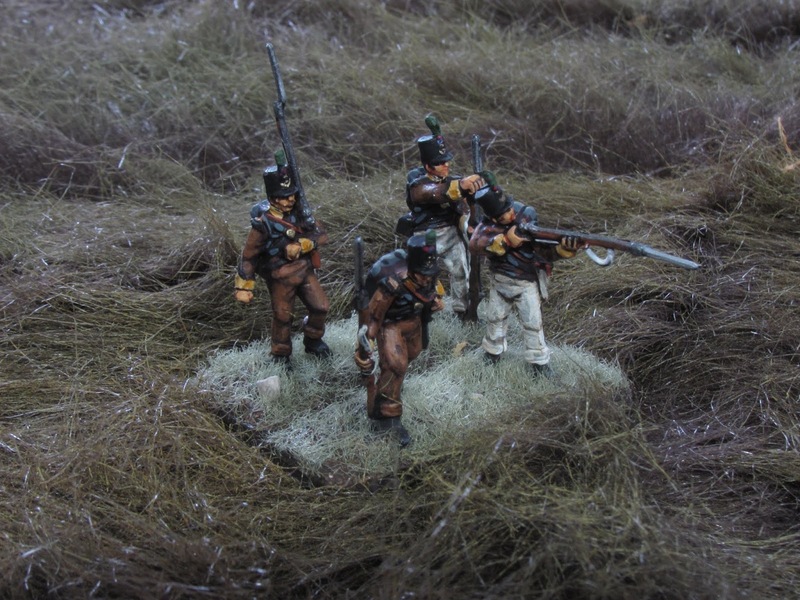 battered division out of Espinosa. With Martinenego driven out of Espinosa the Spanish right is enveloped by Ruffin’s brigade. 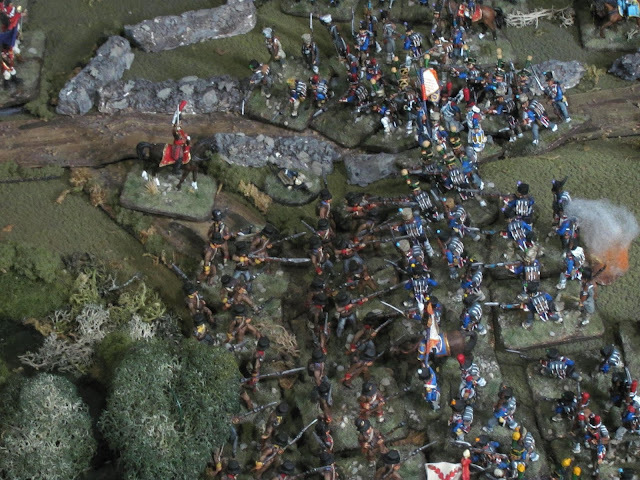 The Asturian militia retreating form the field, while above them Ruffin occupies Espinosa. The Spanish have proven surprisingly sticky, Mahy’s brigade driving back one of Vilatte’s deep into the stone-walled area although the second (Vilatte’s élite light infantry, with the general in personal command) successfully and somewhat unwisely has driven deep into the Spanish lines. 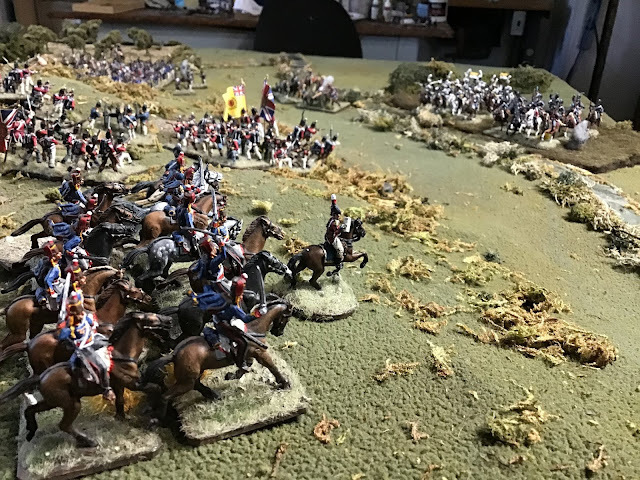 At the top the cream of Blake’s army still holds the high ground untouched while Marshal Perrin is happy to have General Lapisse hold his position in front of them while he works to roll up the Spanish right. After driving off one French brigade, Spanish marshal Mahy, in direct command, wheels and drives into the flank of Pacthod’s light infantry. This French brigade has been unlucky from the beginning, driven off early and then suffering under Spanish cannon fire before this point. Musketry and cannon fire reduce them further and they are sent reeling back by the Spanish, spent, and Vilatte is captured - the Spanish’s first and only real success of the day! Ruffin is now firmly established on the Spanish right flank and emerging from Espinosa to assault the high ground and roll up the Spanish right. 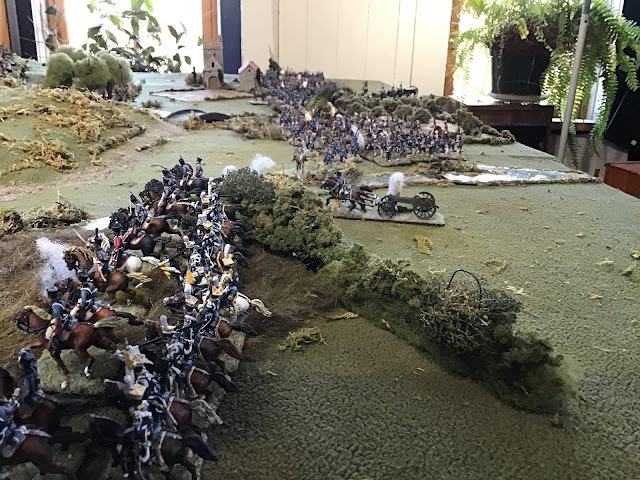 The fight has gone out of the Spanish now (testing at -6 and more on maneuvers as a result of losses) and Blake is unable to block the French advance as his troops begin to break and fall back towards the rear. 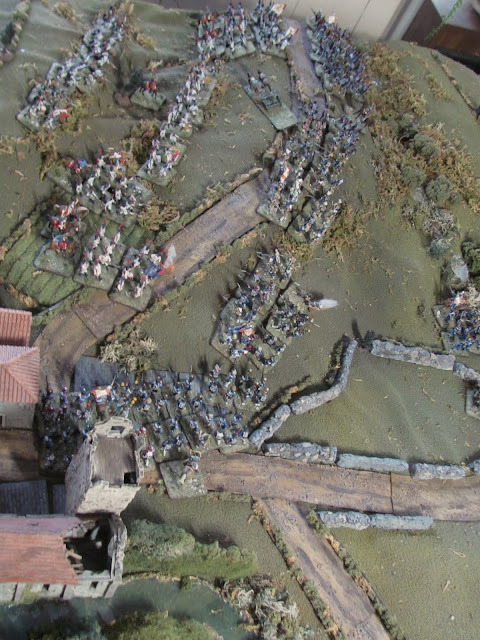 Lapisse’s brigades now assault the high ground as the Spanish give way, and his troops capture the Spanish cannon. 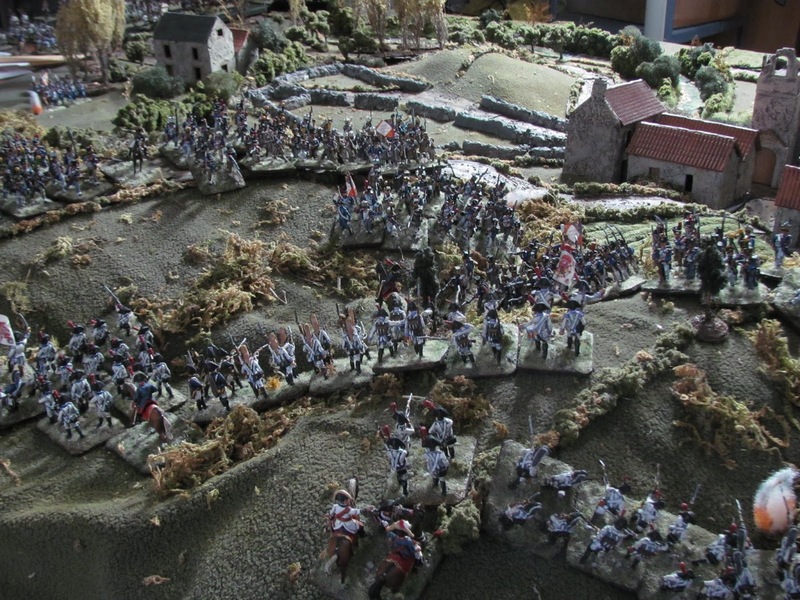 French advance solidly in line while Pacthod's battered brigade can be seen in retreat far right. Mahy’s brigade, Heroes of Espinosa, alone on what remains of the Spanish right are assaulted from front and flank and rout entirely from the battlefield. With now superior French forces encroaching on all fronts the remnants of Blake’s army retreat into the mountains, leaving the field to a decisive French victory.